RAIN FALL is set in rain-soaked Westport, amidst mine closures and the decline in dairy prices. The town in depressed; the residents trying to make the best of things. But when 15-year-old Annie misses an important basketball game when her mate’s house across the street blows up while surrounded by the Armed Offenders Squad, and it looks like her Dad’s job might be the latest victim of the Stockton Mine staff reductions, and when she meets a rodeo star, things are never the same again. RAIN FALL is a YA novel, told from Annie’s point of view. She is a realistic young woman, describing what it is like to be one of her peers: “You are all just the same. You are all just nobodies.” And of living on the Coast “This is the West Coast, … Anything can happen tomorrow. We take what we can get today.” Her descriptions of Westport are great, when asked when the wet season is: “It starts about the first of August and goes through until about the end of July”, and if the Buller River floods “Nothing survives if caught in its waters”. So, a great environment to set a mystery, the young lad who blew up his house is generally thought to not be capable of hurting anyone: “Doesn’t sound like the Pete we know.” And the townsfolk keep information close, they are a besieged lot, they are pro-mining, pro-hunting, and not just anti ecological activists but pro Rimu-logging. Annie has picked up the secrecy bug and fails to tell her parents several things, including her knowledge of vital clues, and about her relationship with Jack, the rodeo star she meets on the beach while riding Blue, her horse – and yes, we are in pro-rodeo territory as well. Once Annie and Jack meet, we are in a real YA romance novel; first kisses, mistaken beliefs, not knowing whether to trust or divulge secrets. Jack’s father is the detective sent up from Christchurch to find the missing Pete (no human remains being found in what’s left of his house), as well as blowing up his house Pete is known to have shot up the local Police station. And Jack’s dad is also there to solve a suspected murder that is somehow connected with the explosion. The Police think maybe a drug deal gone wrong, but they are struggling finding out what has happened. And all we know is via the conversations Annie overhears, or the things she works out, or that she sees on TV between reports of conflicts in Syria and Iraq. The Coast is a real character in the story, and its history is hauntingly evoked: People struggling on farms their families have been on for over a hundred years, the moving roll call of mining disasters, and the five layers of wall paper coming down in Annie’s house, in preparation should they have to move. Annie has been in Westport forever, but her parents only moved there when she was a baby, so they are much more comfortable about moving should her father lose his job, while Annie is in a state of trauma about a possible move. She is a young woman amidst a whole lot of change, and she makes some quite rash decisions that get her, and Jack, into danger. 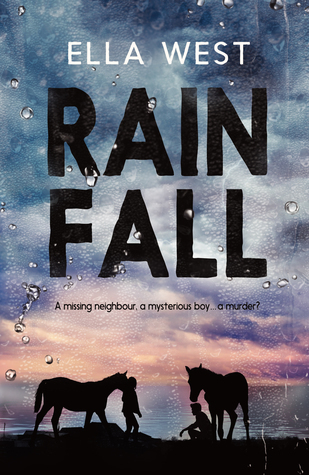 RAIN FALL is a love story, a murder mystery, a thriller, a book for horse-lovers, but what I most liked about it was its portrait of a town struggling with massive social change, and the character of Annie, she can ride, she can shoot (guns and basketball goals) and yet she has a lovely teenage fragility. It is a YA novel but is a good read for older people too! Alyson Baker is a crime-loving librarian in Nelson, New Zealand. This review was first published on her blog, which you can check out here.